By now, it should be clear that I've bought a round-trip ticket on the No Road Home Express. I was ecstatic at the start; I cooled off in subsequent issues, and I already raised the fundamental question of "is this really worth $4 a week?" This week, the answer to that question is an unqualified "boy howdy you betcha!" The opening scene tables the imminent Hulk vs. Hypnos fight so that Wanda can pick up narration duty and paint the grimmest of pictures when she recaps the team's situation. "Monica? Have you ever wanted to be a witch?" So yes, Virginia, there's hope for the good guys. That's the story of No Road Home #5: The Avengers staging a clutch turnaround in a very dark hour. And I really don't want to provide much more in the way of details. This issue is stuffed with surprises, chief among them a hilarious antagonist for Hawkeye and a gloriously unexpected outcome to Wanda's plan. The script for this issue recaptures the superb pace of #1. It plays the library and Nightmare scenes off against each other with brilliant timing, heightening suspense and delivering developments humorous, shocking, and delightful exactly when they're needed. The art team works frantically to keep up with the script, preserving the flow of the story without a hint of confusion and lavishing plenty of detail on the characters along the way. I do think the battle in Nightmare's Realm gets ever-so-slightly shorted on epic-ness, but offering up some seriously spectacular character work is more than fair compensation. Nyx is deeply impressive here. We get a perfect union of revealing words and art for her. After the last issue gave her a thorough backstory, this one shows off a huge range of reactions - triumph, distraction, confusion, dismay, and rage. She runs a long race and every step is fascinating. The colour team does good work throughout. The library is powerfully dark, Nightmare's Realm is full of greens, and That Place Wanda Goes looks appropriately different from all that's come before. Wanda's plan also gives them the opportunity to put impressive colour work into the powers of Spectrum and the Scarlet Witch. It's another character-rendering high point where colours and art combine in magical ways. No Road Home #5 shows off an insightful understanding of exactly what the story needs: Triumphant action for the Avengers, shocking twists for the plot, and surprises galore for the readers. This is a delightful payoff for sticking with the series so far and a powerful argument in favour of staying tuned for future developments. 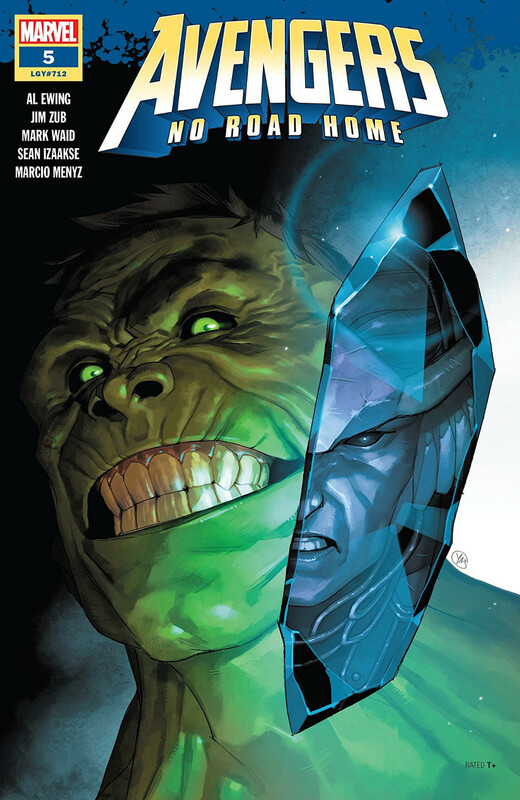 Okay, one spoiler-y observation: The odds of this series bringing Al Ewing's Devil Hulk face-to-face with a certain Cimmerian just got good, and that alone is a powerful argument in favour of climbing aboard for the 2nd half.